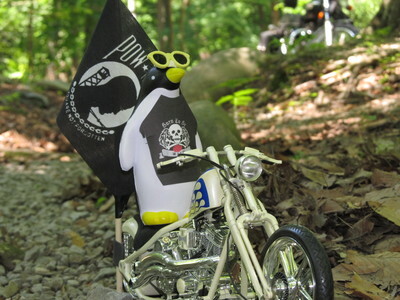 Pierre the Penguin, an unofficial Governors State University mascot, posed with his motorcycle on the Tail of the Dragon (aka Route 129) near Deals Gap at the border of Tennessee and North Carolina. The photo was featured in the article "Pierre Tests the Tail of the Dragon" on p. 2 of the October 1, 2012 GSU View as part of a Take Pierre on Vacation contest. Photographer Jackie Ryon was also announced as the first place winner in the article "And Now, the Winners" on p. 4 of the November 26, 2012 GSU View.